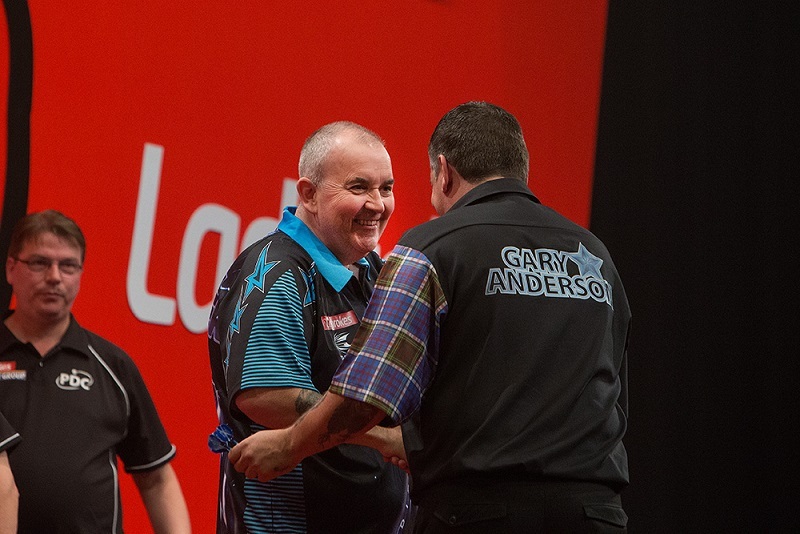 PHIL TAYLOR achieved a World Series record average of 112.41 in a brilliant 10-2 defeat of Gary Anderson to continue his defence of the Ladbrokes Sydney Darts Masters title on Friday, with Michael van Gerwen, Peter Wright and Dave Chisnall joining him in the semi-finals at The Star. Taylor's bid to win a fourth successive Sydney Darts Masters title continued as he followed up his first round defeat of Australian youngster Corey Cadby with a sensational display against the World Champion. Although Anderson shared the opening two legs, he could only watch on as the 16-time World Champion pulled clear in stunning fashion to claim the next eight legs without reply. A pair of 11-darters moved Taylor 3-1 up before he recovered from five misses in the next - which proved to be his only off-target doubles in the game - to land double 16, and checkouts of 129, 115 and 127 followed as he stormed into a 9-1 lead. Double ten from Anderson saw him hit back before he landed a 180 in leg 12, only to see Taylor respond with two maximums of his own in another 11-darter to seal victory. The win extended Taylor's unbeaten run in Australia to 22 matches since 2013 - having won three titles in Sydney and two at the Perth Darts Masters - and moved him through to Saturday's decisive finals night. "To get through was satisfying - I thought it was going to be closer but I had to make sure I kept the pressure on and finished Gary off," admitted Taylor. "The checking out was some of the best I've ever done in my whole career. I just seemed to be very relaxed and didn't feel the pressure at all, and I felt lovely and comfortable. Sometimes they go in and sometimes they don't, but they went in tonight and I felt a bit for Gary because I didn't give him a chance. I've been doing everything possible to win this." Taylor now plays Dave Chisnall, who claimed his third World Series victory of the year against Adrian Lewis as he landed seven maximums in a 10-5 defeat of the two-time World Champion. "I'm really pleased with that," said Chisnall. "I found it a little bit hard but when Adrian isn't on his game and I'm on mine then I know what I can do. Adrian didn't play as well as he can but I was playing well, hitting lots of 180s and my doubles. When I got to 9-3 I was in a good position - he started to come back a little bit, but I'm just glad that 86 went in." 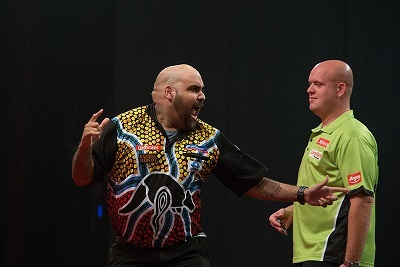 World number one Michael van Gerwen defied two 160 checkouts from Kyle Anderson as he ended Australian hopes in the event with a 10-6 triumph in a thrilling contest. Van Gerwen opened the match with a 180 and took the first three legs without reply, only for Anderson to take out his first 160 checkout in a run which saw him level. Double eight edged van Gerwen ahead before Anderson raised the roof again at The Star with another 160 finish, while the pair also shared the next two to remain locked at five-all. Van Gerwen, though, was aided by his sixth 180 as he regained the lead before breaking throw and then hitting tops for an 8-5 lead. Anderson responded with an 11-darter, featuring his fifth 180, but was unable to prevent van Gerwen from powering into the last four with an average of 104. "I'm really happy to produce a performance such as this," said van Gerwen, who now meets Peter Wright. "When I was 3-0 up I thought it was going to be an early night but I had to keep my focus and I think I finished it off professionally. I know I've got an extra gear and if I play well I know I can do something really good. This is a fantastic tournament but I've never performed like I can over in Australia so I hope I can show everyone my best darts on Saturday." He added: "Kyle is a very talented, good player with a lot of ability but he's still learning. He can be dangerous and we saw that tonight with some of the shots he took out." Wright, meanwhile, was in fine finishing form as he landed ten double from 16 attempts in his 10-4 win over Australia's Rhys Mathewson, who knocked out James Wade in the first round but was unable to repeat his heroics against the world number five. A superb 121 finish in the opening leg saw Wright claim the first of three breaks of throw, and he went on to lead 2-0 and 5-1. Victoria-based Mathewson - who moved to mainland Australia from Tasmania - hit back by winning three of the next five legs as he reduced the gap to 7-4, only to then see Wright halt the fightback in stunning fashion with a 156 checkout. Double 16 moved Wright into a 9-4 lead, and he then traded 180s with Mathewson before sealing his place in a first World Series semi-final of the year on double eight. "Rhys handled himself well on stage and performed well - he proved again that he's a good player," said Wright. "It was okay tonight but wasn't great and I've got to go to another level to win this. The crowd have been great and they were singing for me so hopefully I can give them some more to cheer on Saturday."